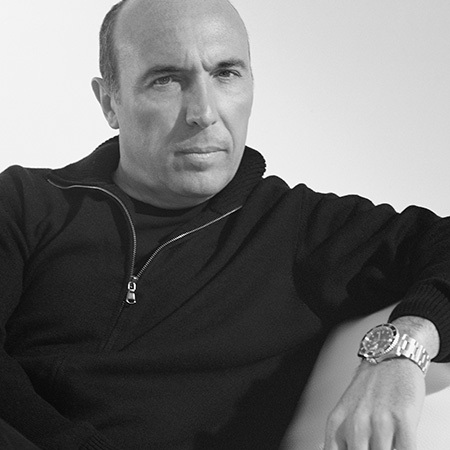 Giuseppe Viganò is involved in industrial planning of furnishing products and in stage-managing of some Companies in the same field. He offers graphic consultancy to realize catalogues, supervising directly the picture, the layouts, the communication and advertising pages. He plans design exhibitions and permanent products in furniture stores or in temporary spaces for specific events, and he personally chooses products and he studies the set. Often the experimentation or the use of a new material becomes a starting point for the design of not only a product but of an entire collection. The research for references from the world of art ,fashion and poetry, are an opportunity to approach the project obliquely, many of its most popular products are born from the concepts of painting and glamorous details, other times they are poetic gestures that create interesting shapes to be developed into new proposals. He collaborated with well-known Companies of this field, such as Poliform, Arflex, Bonacina Pierantonio, Bonaldo, Visionnaire, Arketipo, CIA International, Cogliati & Cogliati, Confalonieri, Matteo Grassi, Emmemobili, Estel, F.lli Longhi, Frighetto, Gamma International, Horus, Ivano Redaelli, Lema, Minotti, Misuraemme, Porada, Saba Italia, Rivolta e la pelle, Tappeti Artexa, Tisettanta. The sit Ellipses designed for Bonacina Pierantonio has been choosen to participate in the selection for the ADI INDEX 2010, for the Compasso d’Oro ADI Award.